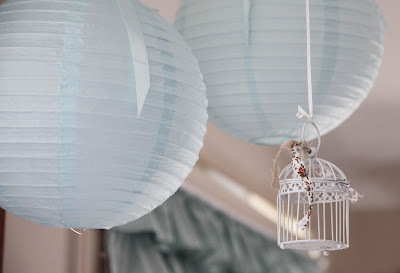 So I am going to come right out and say I love bird themes. Oh and ruffles, love them too. So when Terri Vandermeer asked me to make up some baked treats for a baby shower she was creating with a ruffle and bird theme I couldn't wait to see the results. Here are some of the images. 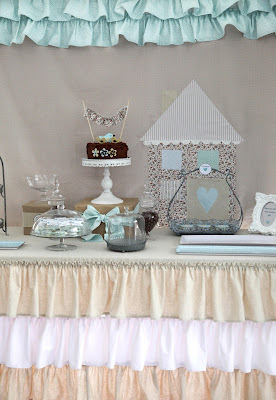 The mother to be was expecting twin boys so the color theme was a muted baby blue and brown. 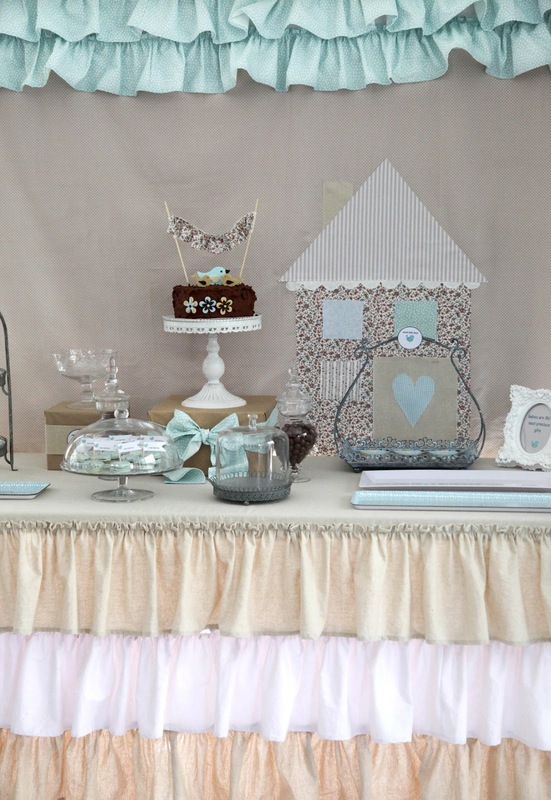 Terri whipped up a ruffled tablecloth and fabric backdrop for the table, and when I say whipped I really mean sewed for hours on end. 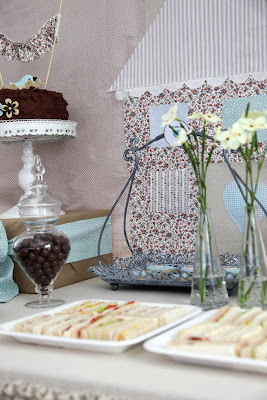 You may have previously seen some of Terri's crafty work on this pretty polka dot party here. 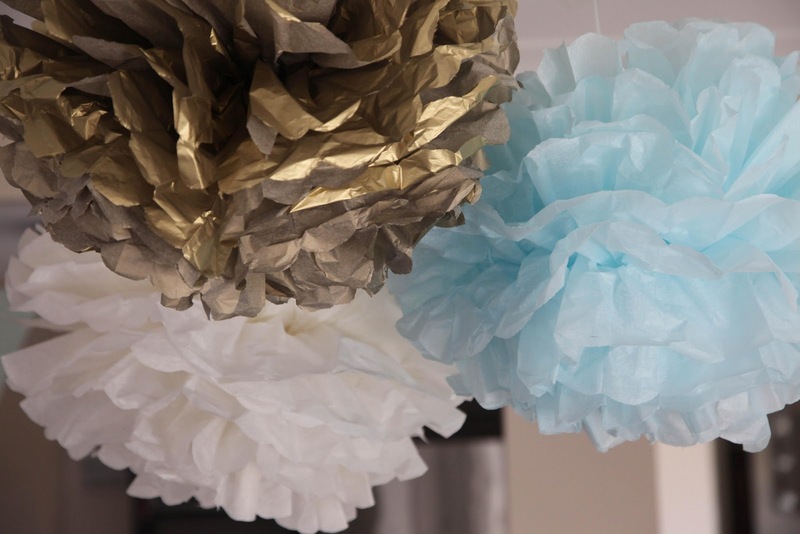 To work in with the ruffly theme Terri made up some co-ordinating paper pom poms, and then she made up the labels herself as well. 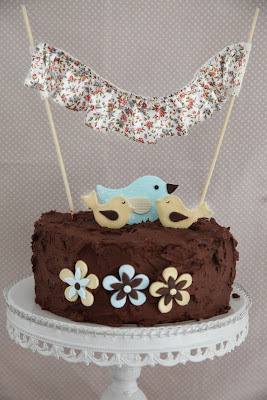 I made a chocolate chip cake with whipped chocolate ganache and a few fondant decorations and then.......you guessed it Terri whipped up the bunting decoration for the top. Also on the menu were coffee ganache macarons with a baby blue shell that was speckled with a coffee/water mixture to resemble bird eggs. 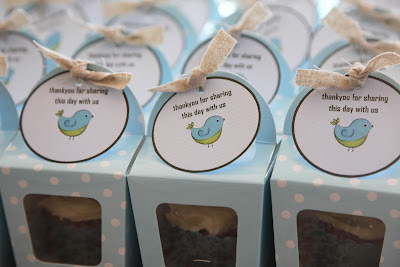 and baby bird cookies with a crafty feel to them inspired by Terri's decorations. Simple iced cupcakes were packed in take home favor boxes with co-ordinating thank you tags. 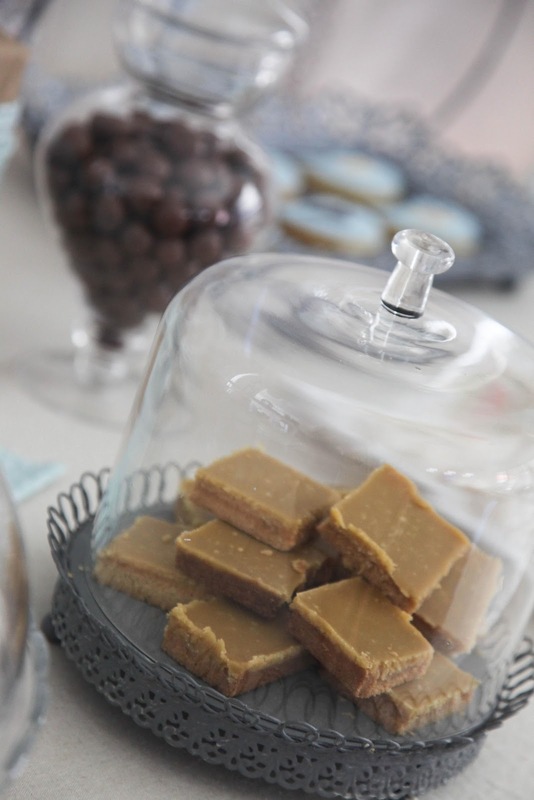 Fudge looks even more delicious in a beautiful cloche covered display. 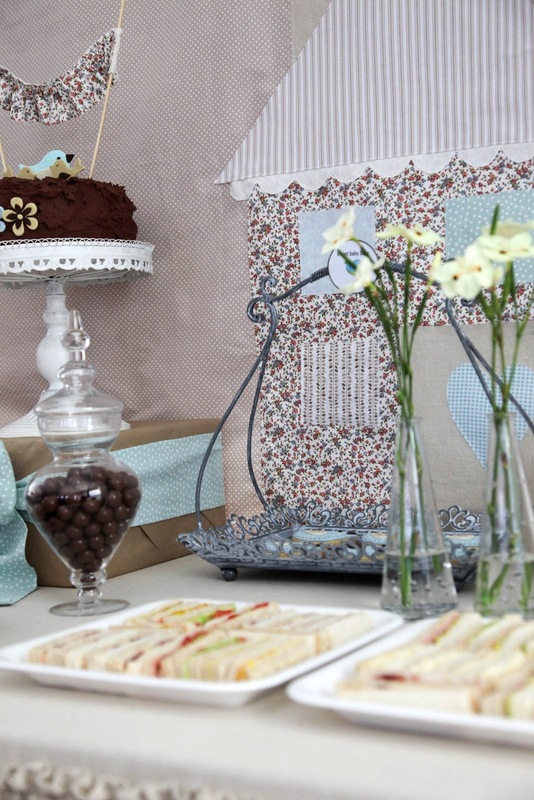 What a super sweet party. 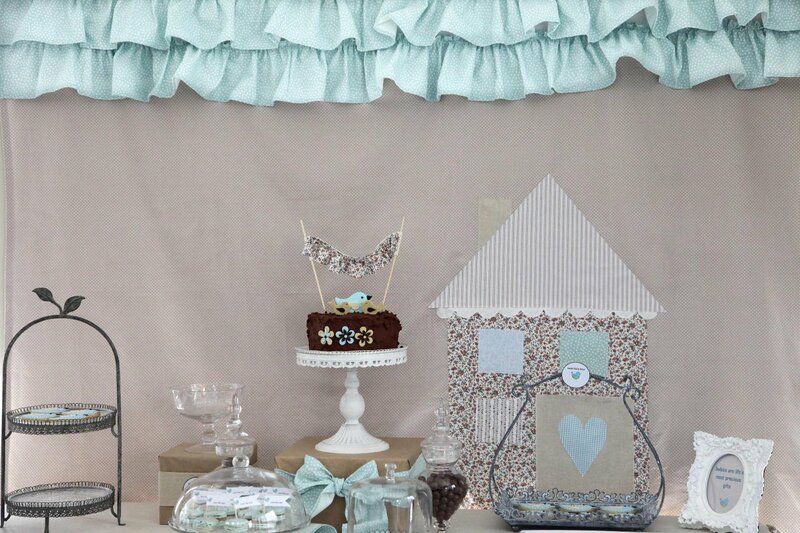 All decorations including the backdrop, tablecloth, pom poms and tags made by Terri Vandermeer. Terri also made the take home cupcakes. 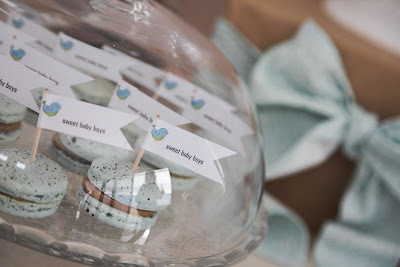 Macarons, Baby Bird Cookies and Cake made by Bubble and Sweet. and the blog tour for my book is winding up now. I'd like to say a big thank you to everyone who reviewed my book. Cute color theme. I also like the little desserts. They look super yummy. Oh my goodness! This is the cutest party! I love birds! I'm definitely pinning this! 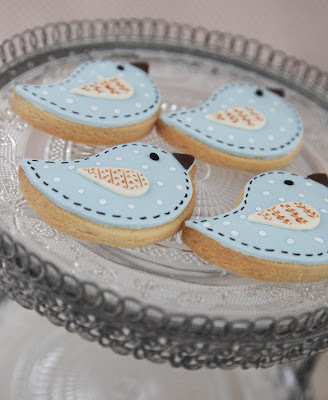 Those birdies are some of the most beautiful cookies I have ever seen! I can't believe such care and attention to detail! Well done! Love, love, love your cake! Your cookies and macarons are perfectly beautiful! Loving the baby bird cookies (as well as everything else!). I've just become an auntie so surely I must make them! Would you share your chocolate chip cake recipe with us? 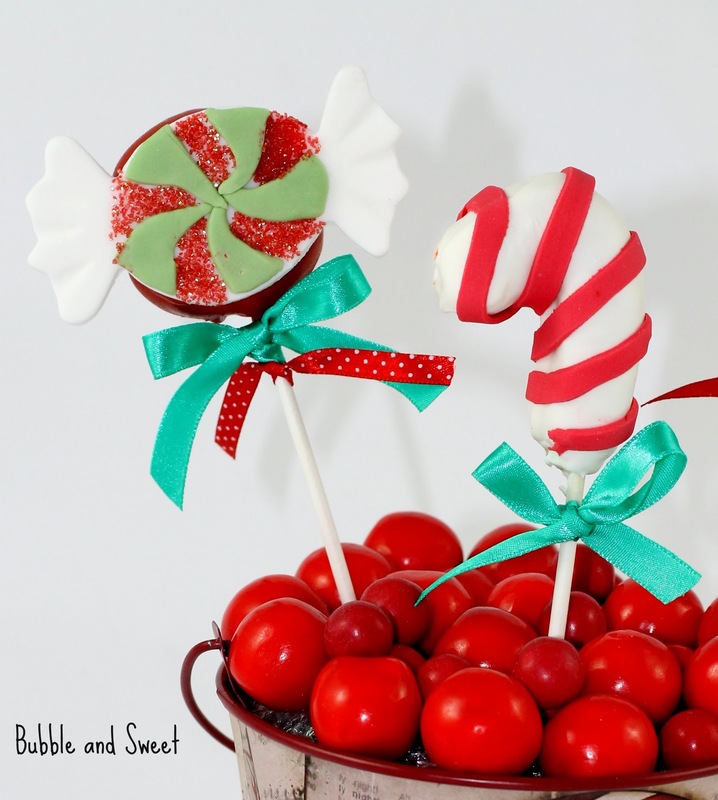 I googled some but thye all call for cake mixes. I am anti-cake mix. Yours looks so yummy. The main thing of this theme is this its cute theme and everyone's lover this.